Chris Webb, (IMCA Stock Cars), Brian Hetrick, (305 Sprints) in Henderson County Illinois along with Alex Buffington ( Hobby Stocks) of Wapello, Iowa all pulled out wins in their respective classes while, Lonnie Bailey (IMCA Late Models), and Scott Hogan (IMCA Modifieds) both got repeat wins for the year at 34 Raceway on Saturday, May 31. Race fans came out to see five classes of racing compete for points and money on Deery Brothers Automotive Night. Chris Webb, Biggsville, took the checkered flag in the 23 car Mike's Auto Parts IMCA Stock Car feature for the first time this year. Webb took the lead from Patrick Mincer on lap seven following a caution and never looked back as he pulled away from the field. With Webb out in front the battle for second would wage behind him between a number of cars. When the fifteen laps were done it was Webb getting the win and John Oliver, Jr. taking second. Cole Simmons, Jason Cook and Cale Samberg rounded out the top five. Another first time win this year went to Brian Hetrick of Stronghurst, in the Sebastian Sandblasting 305 Sprint Feature. Thirteen cars started the 20 lap feature with Jayson Ditsworth of Gladstone, on the pole. Ditsworth took the early lead holding off Hetrick as they moved through lapped traffic. With four laps to go, Hetrick would finally be able to get by Ditsworth for the lead and pulled away to take the checkered flag with a 4 1/2 second margin. Ditsworth had to settle for second followed by Donnie Steward, second in the points race by 11 points to points leader Brian Hetrick. Manny Rockhold and Scott Boles finished out the top five. Quincy's Lonnie Bailey made it two in a row at 34 Raceway winning the 21 car J & J Steel Ideal Ready Mix IMCA Late Model feature on Saturday night. Bailey took the lead in the 25 lap race from Corey Richards on lap ten following a caution. Bailey would then pull away from the field as Tom Goble and Matt Strassheim would battle for second. With Bailey out in front, eyes were on the battle for second as Boone McLaughlin joined the group. With four laps to go, McLaughlin made a move around Goble and began to pull away in the number two spot. Bailey went on to get his second win in two weeks at 34 while McLaughlin finished second followed by Goble, Matt Strassheim and Matt Ryan rounding out the top five. After winning the IMCA Modified feature at 34 Raceway two weeks ago, Scott Hogan of Vinton returned to the 3/8 mile and again went home a winner. Hogan took the lead in the 23 car field from Adam Carson following a caution on lap twelve. But not far behind were Dean McGee and Tyler Cale. The third of three yellow flags came out on lap eighteen which set up a green, white, checkered finish. Hogan held his spot with McGee, Cale and Darin Thye close behind. He went on to take the checkered flag by a single car length over McGee in an exciting finish. Cale, Thye and Carson then finished out the top five. In the final race of the evening it was Alex Buffington of Wapello getting his first win this year in the Pepsi Hobby Stocks. Buffington took the lead from Randy Wachter on lap three of the fifteen lap race and would pull away from the field for the first eleven laps. A red flag came out on lap twelve, when Todd Lange, Stronghurst, flipped going off turn one, and Buffington's lead was cut as Luke McLaughlin would give chase. Buffington nearly lost his lead to McLaughlin coming out of turn four on the fourteenth lap when he got a little loose, but the young racer from Wapello recovered and held off McLaughlin to get his first win this year. 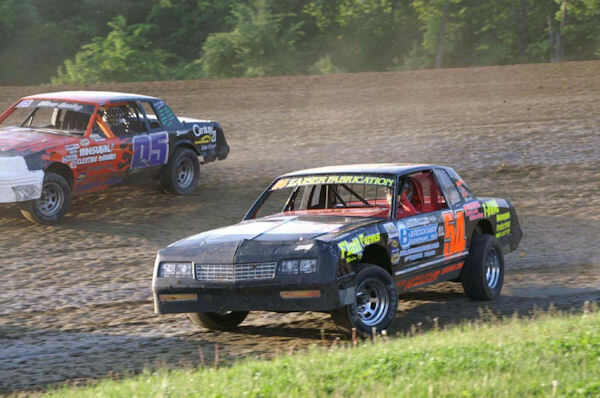 Racing continues this Saturday, June 7 at 34 Raceway with Richard Realty Night with point racing in all five classes. May 31 Results with Illinois residents in bold. FEATURE - 1. Lonnie Bailey, Quincy; 2. Boone McLaughlin, Mediapolis; 3. Tom Goble, Burlington; 4. Matt Strassheim, West Burlington; 5. Matt Ryan, Davenport; 6. Jason Frankel, Quincy; 7. Cory Richards, Burlington; 8. Sam Halstead, New London; 9. Gary Russell, Biggsville; 10. Colby Springsteen, Morning Sun, 11. Justin Reed, Quincy; 12. Jay Johnson, West Burlington, 13. Keith Pratt, Mendon; 14. Matt Bailey, Quincy, 15. Adam Helmick, Fort Madison, 16. Tom Bowling, Danville, 17. Andy Nezworski, Buffalo, 18. Kenny Foor, Wapello, 19. Tom Darbyshire, Morning Sun, 20. Jay Chenoweth, Wapello, 21. Stephan Kammerer, Blue Grass; Heat winners-Strassheim, Russell, Halstead. Heat winners-Todd Holsteen, Kinsley, Samberg. FEATURE - 1. Scott Hogan, Vinton; 2. Dean McGee, Galesburg; 3. Tyler Cale, Donnellson; 4. Darin Thye, Burlington; 5. Adam Carson, Colchester; 6. Bill Roberts, Jr., Burlington; 7. Jeff Gerhardt, Niota; 8. Andy Krieger, Burlington; 9. Kevin Goben, Sherrard; 10. Dusty Kraklio, Durant. 11. Mike Weikert, Jr., Muscatine, 12. Brad Carson, Colchester, 13. Dennis LaVeine, Burlington, 14. Mike Hill, New London, 15. Jim Redmann, Lockridge, 16. Jeremy Harris, Burlington, 17. Adam Swanson, Burlington, 18. David Goble, Burlington, 19. Brandon Rothzen, Media; 20. Dave Anderson, Burlington, 21. Phillip Beard, Winfield, 22. Dennis Betzer, Central City, 23. Jack Matthews, Colchester; B-Main winner - Jim Redmann, Lockridge. Heat winners-Carson, Weikert, Jr, McGee. FEATURE - 1. Brian Hetrick, Stronghurst; 2. Jayson Ditsworth, Gladstone; 3. Donnie Steward, West Burlington; 4. Manny Rockhold, Pekin; 5. Scott Boles, New London; 6. Justin Parrish, Des Moines; 7. Kevin Hetrick, Gladstone; 8. Seth Wilke, Burlington; 9. Dustin Whiting, Burlington; 10. Justin Newberry, Burlington, 11. Nick Geursey, Burlington, 12. John Draper, Bryant; 13. Cale Hutchings, Bloomfield. Heat winners - Guernsey, Ditsworth. FEATURE - 1. Alex Buffington, Wapello; 2. Luke McLaughlin, Mediapolis; 3. Matt Gavin, Kirkwood; 4. Randy Wachter, Burlington; 5. Tanner Thomann, West Burlington; 6. Eric Rowley, Burlington; 7. Craig Griffin, Monmouth; 8. Mark Kemper, Wapello; 9. Brodie Dopler, Wapello; 10. Blaine Dopler, Wapello, 11. Jason, Gerdes, Lomax; 12. Chad Krogmeier, Burlington, 13. Sky Griffith, Wapello, 14. Chuck Underwood, Burlington, 15. Jeremy Pundt, Donnellson, 16. Brian Tipps, Wapello, 17. Dean Kratzer, Fort Madison, 18. Todd Lange, Stronghurst; 19. Dan Wenig, Danville, 20. Doug Fenton, Burlington, 21. Brandon Peitz, Burlington, 22. Victor Hastings, Oquawka; 23. Chad Witte, Burlington, 24. Randy Samberg, Burlington, , 25. Josh McKasson, Wever. Heat winners - Thomann, Gavin, Buffington. Chris Webb, Biggsville, battles John Oliver, Jr. of Danville, Iowa during one of three IMCA Stock Car heat races at 34 Raceway Saturday, May 31. Webb went on to win the Stock Car feature race for his first win of 2008.